DavidNews HYIP blog - News & Reviews: Capital7 - We all know - We can trust! 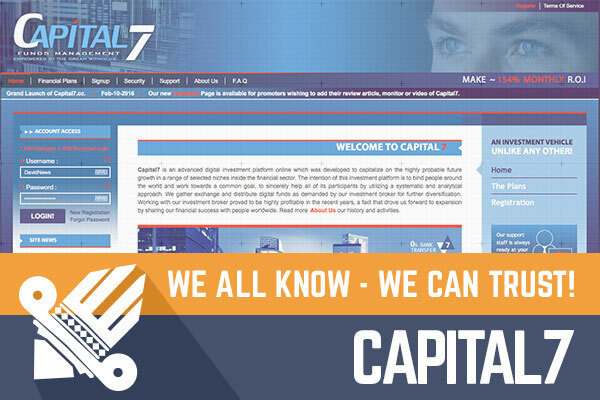 Capital7 - We all know - We can trust! Few days ago online started a project called Capital7 and without any hesitation, I made a personal investment in this project and added it to DavidNews.com Golden Stage listing. Looks like everyone like this project from the start and, without a doubt, invests Bitcoins and other currencies worth thousands of dollars and further, I will explain you the exact reason for that. As you know, Capital7 has started just recently, but it is obvious already that this will be a very profitable journey for every one of us. The primary reason I added this project without waiting for the administrator is simple - I want DavidNews.com community to begin to make a profit ahead of anyone else. This way you will be able to make more money for yourself. Yes, some people say that this project comes from an old administrator, what is right by the way, but this time, the facts speak for themselves - the previous project was paying for 140 straight days. I think that you will agree that 140 days is an excellent lifetime that allowed countless individuals to make significant profits; not just a few dollars but hundreds of thousand dollars and Bitcoins profit. That's why I'm also sure that this time there will be people who will earn a lot. As you know - First-come, first-served is appropriate also for this project - earlier you will jump on board more profit you will gain. So much about the project, but now is time to tell a little bit more about earning opportunities with it. There are two options how to earn with Capital7 - daily investment plan (7% daily interest for 30 calendar days (payments paid only on working days)) and investment plan that will pay single 110% payment after one week. With second investment option, everything is clear - you deposit and after one week receive 110% (10% profit). Since first investment plan pays interest only on working days than if you spend on Sunday, Monday, Tuesday or Wednesday, there will be 22 profit days, therefore, 154% return. But if you spend on Thursday, Friday, Saturday, there are only 21 profit daily, so your income will be just 147%. So, take in mind what I wrote here because 7% is quite a lot and it would be unwise to miss this part of the profit. Apart from profit-making, there is one more thing that you need to take in you mind - withdrawal fee is 2%. In conclusion, it is evident that Capital7 administrator is experienced and professional because he has started this project at the very beginning of this investment season what is going to be a very profitable for all of us. Because this project is remarkably good, I decided together with article publication to add it to Pinned Golden Stage position where is the right place for a project like this. Maybe some will say that I'm way too cheerful about this project, but my previous experience was very positive with great projects such as this. Sure thing, there is a risk that this project could not turn out as good as I told, so invest just that you can afford to lose. Investment plans: 7% daily for 30 calendar days (paid only on business days), initial deposit included in the payments, 110% after seven days. Cash-out: Manual, minimal withdraw $2.50, withdrawal fee 2%. Did you consider exchanging with the ultimate Bitcoin exchange company: Coinbase. Have you ever tried automating your free BTC collections with a BITCOIN FAUCET ROTATOR?